Tim Van Orden takes a bite out of heart disease. Today, I want to discuss a new study that recently appeared in the Journal of Functional Foods. This study looked at the consumption of apples and it’s effect on heart disease factors such as the oxidation of LDL cholesterol in the bloodstream. The results are quite exciting. 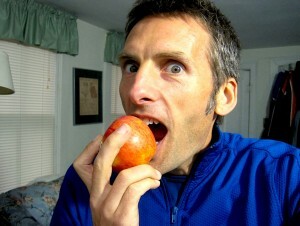 Consumption of one apple a day for four weeks, can decrease the oxidation of LDL in the blood by 40%. This is very good news. There is a lot of confusion in the media about the nature of heart disease and it’s causal factors, such as LDL ‘cholesterol’. To help clear this up, I’ll give you a quick primer on LDL. It stands for Low Density Lipoprotein. It’s a type of protein-based transport molecule that delivers fats, lipids and cholesterol through the blood. LDL itself is not a bad thing. But when LDL becomes oxidized in the blood it becomes dangerous. So reducing LDL in the blood is not the best course of action, but reducing oxidation of LDL in the blood is a much better course. Apples and other fruits and vegetables contain anti-oxidants. These anti-oxidant molecules reduce the oxidation of many components of our bodies, including LDL. So consumption of more fresh fruits and veggies is a great strategy for increasing the levels of anti-oxidants in your blood and reducing the chance for things like LDL to oxidize and become damaging. The moral of the story – eat your fresh fruits and veggies. This entry was posted in Diet Tips, Health, In The News, Nutrition, Scientific Studies and tagged Antioxidants, Apples, Arteries, Cholesterol, Diet, Disease, Fats, Free Radicals, Fruits, HDL, Health, Heart Disease, Heated Fats, Illness, Journal of Functional Foods, LDL, Lipid Peroxides, Lipids, Lowering Cholesterol, Oxidation, Oxygen, Placebo, Plaque, Polyphenols, Scientific Studies, Video, Whole Foods. Bookmark the permalink. Hi Tim, I hadn’t heard LDL and HDL cholesterol explained that way before. Thanks for sharing!